Ok, I know Spiced Pumpkin Seed Almond Butter doesn’t have the best ring to it, but it’s freakin’ delicious and that’s all that really matters! Not only that, it was SO SIMPLE to make. I’ve actually never made my own nut butter before and just went for it. All you really need is a legit food processor (AKA not one that’s going to burn out on you..don’t say I didn’t warn you). An optional step to this (that I think is not so optional if you want this to be the best fall treat ever) is to roast your almonds for about 10-15 minutes on 250 degrees. Let them cool before placing into food processor. I would also recommend using sprouted pumpkin seeds. Sprouting packs an extra nutritional punch by boosting fiber and antioxidant content, plus it’s better for digestion. Pro tip: Refrigerate your needs and seeds. Storing them in airtight containers is the first step, but it’s even more important to keep em cold. They’ll only last at room temperature for a few months before beginning to absorb outside toxins and become rancid. In general, they’ll stay fresh for up to six months stored in the refrigerator and for up to one year stored in the freezer. I used 3 cups of roasted almonds and 1 cup of sprouted pumpkin seeds then blended and blended and blended and blended. It took me about 30 minutes to fully blend them until they were smooth and creamy because I was continuously giving my food processor a break when it started to warm up. It may seem like it’s not progressing, but stick with it. It’ll go from a floury consistency to chunks, to grainy looking nut butter, to smooth and creamy. Because the pumpkin seeds I used have added Celtic sea salt, I used unsalted almonds and didn’t add in any additional salt. Once it’s blended nicely, transfer your spiced pumpkin seed almond butter to a glass jar and store it in the fridge. It should last about a month but good luck lasting that long! If you decide to make this simple fall recipe, tag me! I would love to see how you used it. 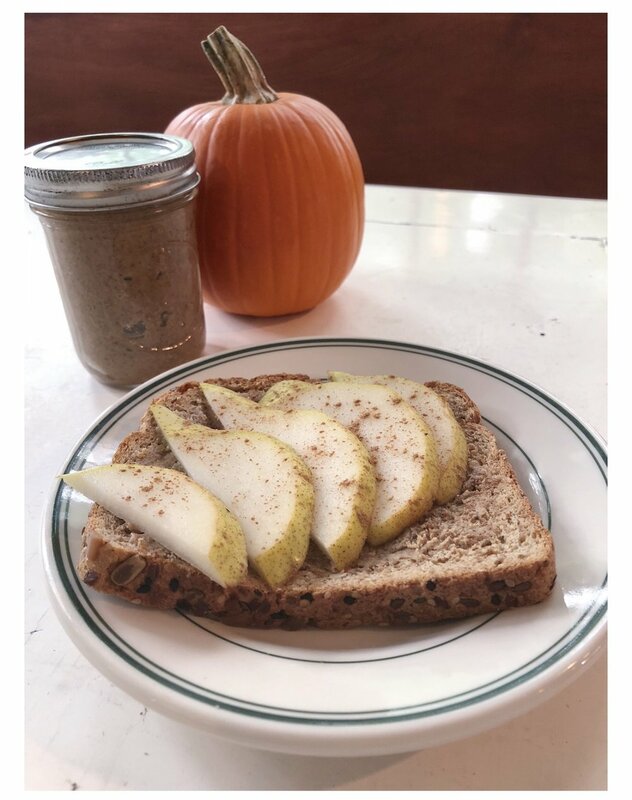 I loved eating it plain, on a slice of Ezekiel bread topped with pears or persimmons, spread onto apples, or as a topping to my smoothie bowls. This is seriously one of the most delicious and versatile recipes I’ve created! I hope you love it as much as I do. do you want more delicious, healthy and festive recipes? sign up with your email address and get them sent right to your inbox!